Sterling Pumps has many pump models compliant with American Petroleum Institute API 610, Edition 11, Dec 2009, Standard for Centrifugal Pumps for Petroleum, Petrochemical and Natural Gas Industries. The American Petroleum Institute (API) is the main US Trade Association for the oil and natural gas industry, representing about 400+ corporations involved in production, refining, distribution, and many other aspects of the petroleum industry. The development of technical standards and guidelines are the most important fields of the API with each publication overseen by a committee with publications developed by API member company engineers and other professionals. The recognition and influence of API standards is global and extends far beyond the borders of the United States. 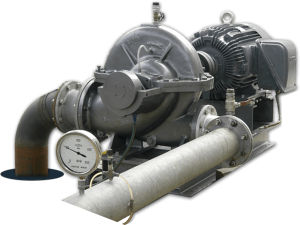 API pumps are used in refineries, petrochemical and chemical industry, power stations as well as in seawater desalination systems utilising RO (Reverse Osmosis). API 610 specifies requirements for centrifugal pumps for use in petroleum, petrochemical and gas industry process services. API 610 is an International Standard and is applicable to Vertically Suspended pumps (VS 1-7 type), Overhung pumps (OH 1-5 type) and Between Bearing pumps (BB 1-5 type). Design configurations include side discharge units using end suction pump hydraulics in a vertical sump pump. Vertical can pumps can be designed to enable the pumps to operate in low NPSH a situations. Wet pit, vertically suspended, single-casing diffuser pumps with discharge through the column. Wet pit, vertically suspended single-casing volute pumps with discharge through the column. Wet pit, vertically suspended, single-casing axial-flow pumps with discharge through the column. Vertically suspended, single-casing volute line-shaft driven sump pumps. Vertically suspended cantilever sump pumps. Double-casing diffuser vertically suspended pumps. Double-casing volute vertically suspended pumps. Overhung pumps come in a variety of configurations and are manufactured to a number of international standards including API, ANSI and ISO. Foot-mounted single-stage overhung pumps. (This type meets all requirements of the International Standard for ANSI and ISO). Centreline-mounted single-stage overhung pumps. They have a single bearing housing to absorb all forces imposed upon the pump shaft and maintain rotor position during operation. The pumps are mounted on a baseplate and are flexibly coupled to their drivers. Vertical in-line single-stage overhung pumps with separate bearing brackets. They have a bearing housing integral with the pump to absorb all pump loads. The driver is mounted on a support integral to the pump. The pumps and their drivers are flexibly coupled. Rigidly coupled vertical in-line single-stage overhung pumps. Rigidly coupled pumps have their shaft rigidly coupled to the driver shaft. (This type does not meet all the requirements of International Standard). Close-coupled vertical in-line single-stage overhung pumps. Close-coupled pumps have their impellers mounted directly on the driver shaft. (This type does not meet all the requirements of International Standard). The Between Bearing pumps are designed for heavy duty, high pressure and high temperature applications in industrial and HPI services. Applications range from light hydrocarbons at low temperatures, to corrosive fluids, vacuum bottoms and other services at high temperatures. Axially split 1 and 2 stage between-bearings pumps. Radially split 1 and 2 stage between-bearings pumps. Axially split multistage between-bearings pumps. Single-casing radially split multistage between-bearings pumps. 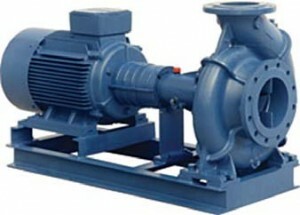 These pumps can also be called ring-section pumps, segmental-ring pumps or tie-rod pumps. Double-casing radially split multistage between-bearings pumps (barrel pumps).